Want to save this information for later? Grab your PDF cheat sheet of this post, The Ultimate Tool Guide for Trimming Dog Nails, here. For those that know me, I can be a little dogmatic when it comes to cutting dog nails. I admit it. Right up there with my hot buttons of taxes and entitlements, are long dog nails. Let me put it this way, growing long nails on an otherwise gorgeous dog is like painting the Mona Lisa with a milk mustache. Eeeww! I empathize with those of you for whom cutting your dog’s nails is a real struggle. I get it. I was there too not that long ago. If you are in this group and would like a more step-by-step “how to” approach to cutting your dog’s nails, read The Ultimate Guide To Cutting Dog Nails And Having Them Love You For It. In there I focus on using a Dremel, however, the tips are easily transferable to using a traditional dog nail clipper. In preparation for this post I reached out to the Big Dog Mom Facebook audience to see what equipment they were using for nail cutting. The overwhelming majority of folks are using a Dremel. Out of 81 people who voted, 63 are using a Dremel while 18 are using a traditional dog nail clipper. In addition, several people commented that their use of a Dremel or clipper was completely dependent on specific dogs and based on how well they tolerate the sound of the Dremel. In the spirit of getting your dog’s nails to a healthy length, it really doesn’t matter which tool you use. As long as you are doing it or getting the job done (well), that is what matters and I commend you for making nails a priority. That said, this post is dedicated to my fellow Dremel users or anyone who aspires to use a Dremel for cutting their dog’s nails. I received the Diamagroove™ Rotary Tool (Boxer) from my sweet husband for Christmas and have used it a total of 5 times as of the date of this publication. This is a review of my experience with the Diamagroove™ so far. On the outset I must tell you that I am NOT being compensated in any way for this review. I wish I was, but I’m not. It is an honest review of my personal experience and not, in any way, in partnership with the manufacturer, Whitman Sharpening. As with all of the content here on Big Dog Mom, my goal is to share my thoughts and experiences as a big dog parent to inform and empower all of you. We are on this journey together. The first time I put the Diamagroove™ bit on and used it, it seemed very warm to me. I use a flexible shaft attachment for my Dremel and by the second dog, it was almost too hot for me to hold comfortably. Perhaps I didn’t have the bit inserted correctly or something wasn’t quite tight enough. It makes sense to me that faulty insertion of the bit would increase friction and, as a result, cause it to heat up. Fortunately, the dogs didn’t seem to mind so my guess is their nails stayed at least as cool as they did with the traditional bit. Fortunately, I have used the Diamagroove™ 4-5 times since and I have not experienced heat anything like the first time. In fact, the flexible shaft attachment that I hold on to has been completely cool to the touch the last few times I have cut nails and the bit itself stays cool which translates to less heat on the dog’s nail. This, for me, has been one of the most significant advantages of the Diamagroove™. One thing I love about the Dremel is my ability to get very close to the quick of the nail without actually nicking it and causing it to bleed. Because the Diamagroove™ stays so much cooler, I have been able to take my time getting Junior’s and Sulley’s nails cut. I usually keep the speed on my Dremel between 10,000-15,000 RPM due to the increased sound at the faster speeds. I have found that with the Diamagroove™ I am able to more quickly cut the boys’ nails at the same speed. And because it stays cooler than my old bit, I am able to use my time to shape the nail and really get them close to the quick without nicking it. Because I trim nails once per week, my Dremel bits get pretty worn out. With a traditional Dremel bit you can see the wear on the sandpaper as you are cutting the nail. And over time these bits need to be replaced. In the short time I’ve been using the Diamagroove™ I have not seen any wear on it whatsoever. 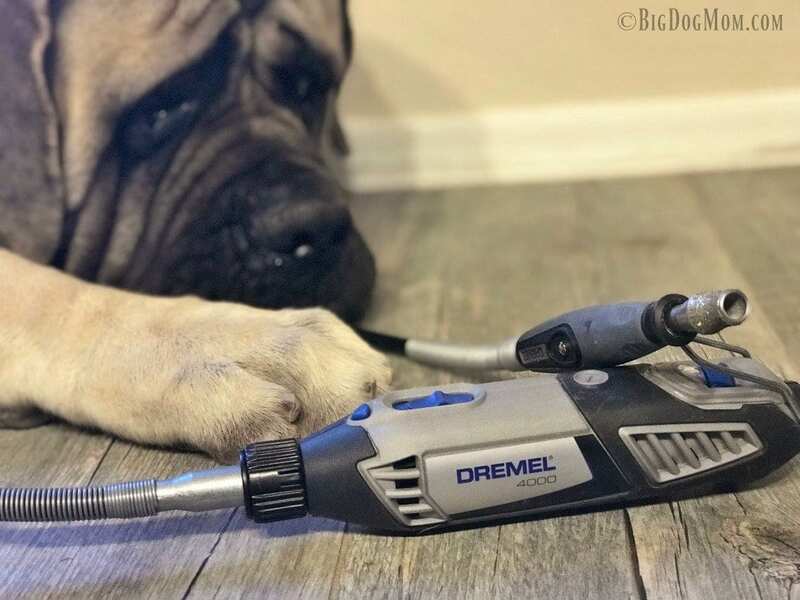 Testimonials from fellow big dog friends who have been using the Diamagroove™ for over a year have supported the company’s claim that it will outlast other rotary tools. Time will tell. This model has a concave design and grit all the way to the tip. It is specially designed to polish/grind the topside of the nail as well as grind the end of the nail making it a terrific option for dog groomers, dog breeders and anyone who wants healthy short nails and gorgeous paws. The combination of this bit and the flexible shaft attachment have made the entire experience of cutting my big dogs’ nails easy and efficient. The Diamagroove™ is manufactured by Whitman Sharpening located in Michigan. The cost of the Diamagroove™ is $150. You heard me right, $150, for a Dremel bit. You may be tempted to hit the back button right now, but let me explain why I feel this bit is worth the investment. First, dog nails should be a priority. Keeping your dog’s nails at a healthy length not only looks better, it’s better for them. Long nails can cause pain both from compensated movement and from the nail being pushed up into the nail bed. These are huge issues, especially for big dogs. The total cost is $150. If you divide that by 12 months in a year, the Diamagroove™ would cost you $12.50 per month. I cut nails at least once per week. So if I take that $12.50 and divide by, say, 4 weeks per month, that equals $3.13. With that number in mind, think about what else you spend $3.13 on each week; Starbucks, fast food, or even random toys or treats for your dog. Perhaps there is room in your budget to eliminate one small item per week in order to start your Diamagroove™ fund? I wanted the Diamagroove™ for several years before I got one and so far I am really happy with it. Junior and Sulley seem to enjoy the cooler bit and more efficient cutting which are the most important metrics for me. But given the substantial financial investment, I am interested to see how well it holds up over time and how that compares with the traditional bits that come with the Dremel. Do you have a Diamagroove™Rotary Tool? If so, I would love to know how my experience compares with your own. If you don’t have one, would you consider getting one? Why or why not? Please drop me a note in the comments below. That’s a serious dremel. Makes mine look like a child’s toy. I’ll definitely have to check that out! The thought of clipping my dog’s nails terrifies me! We have a fabulous groomer that does them for me. She’s further away now that we’ve moved. I might have to look into this option. You are not alone, Sadie. Many people get anxious over the thought of cutting their dog’s nails. I’m sure with a little practice you would be able to do them just as well, if not better, than your groomer. Just last week I shadowed our dog trainer on a therapy dog visit. While we were waiting for the session to begin, she showed me her dog’s nails. I was touching Wrigley’s paws in awe! They were so smooth, which is important for a therapy visit. She clips and hones all of her dogs’ nails! I just don’t think I can do it. I’m too nervous right now. Maybe some day when Bernie and Lizzie aren’t as energetic, and I’ve had one-on-one tutoring. I will be saving this post, though, for that future reference. Paying “more” for the Diamagroove makes sense to me. You’re someone who’s going to use it regularly, and you expect quality results. Sometimes I scratch my head when I hear people expecting things for free and then balking at the quality. I clip my cats’ nails on a regular basis, but they are small and white, so I can see the quick. I’m afraid to trim my mom’s dog’s nails because his nails are black. He would never stay still for the diamagroove. That’s great that you are cutting your cats’ nails. I would love to see a video of that. Are they pretty tolerant of being held and clipped? It seems like a big expense up front, but if it works well, I think it is a great investment! Your dogs’ nails look great. Thank you so much, Beth! Yes, so far I do believe the quality is there to justify the investment. The Diamagroove sounds like a great tool! I’ll admit that I’ve never once trimmed our dog’s nails at home. We take him regularly to the vet and/or groomer to have it done. But if we ever wanted to do it at home, this sounds like a good tool. Haha! Well, at least you know his reaction is through no fault of yours. I’m happy he’s getting them done regularly at the groomers and that it’s a non-event for him. Here you show some of the details of how to use a Dremel to grind a dog’s nails. I did not know how to use it. But through this blog, I got to know about it. Thanks for sharing one of the best blogs on this. Thank you so much, AnneMarie. I’m so happy this was helpful for you. It’s October now, how has your Diamagroove held up? I have wanted one for a while for our two Great Danes but didn’t want to spend the money. Hi! I love the Diamagroove. I am using mine on 5 pound toy poodles with black and dark brown nails. Blowing the residue off the Diamagroove. You really do need to clean it properly. The brass brush and Diamakleen really do make a difference. Dremel, Dremel, Dremel and everything is working fine. Then you clean the Diamagroove and Dremel and OMG! what a difference! Yes, it’s another cost, but it really makes a difference. Diamakleen is a Whitman’s product and it’s possible that you must buy it from them. Mine is almost 2 years old and there is no sign of wear. I really love this tool! Thank you, Karen! I couldn’t agree more! I love my Diamagroove Dremel bit and believe it is well worth the added cost compared to the traditional Dremel bits that come standard with the tool I have to admit that I didn’t order any cleaner with mine as it was a gift. I will definitely check this out. Thank you!